The What: The Sound Control Technologies RemoteCam4 and RemoteCam5 are camera extension kits for PTZ cameras. 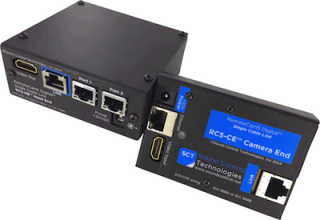 The What Else: The new RemoteCam4 from SCT supports all major manufacturers’ RS-232 and HDMI (CEC) controlled PTZ cameras, providing power, control, 1080p video, and IR up to a distance of 300 feet over a single CAT5e or CAT6 cable. The new RemoteCam5 supports all major manufacturers’ ethernet-controlled PTZ cameras providing power, control, 1080p video, streaming video (if camera is enabled), and IR up to a distance of 300 feet over a single CAT5e or CAT6 cable. The Bottom Line: The RemoteCam4 and 5 camera extension kits offer a cost- and time-saving alternative when integrating digital high definition PTZ cameras into a wide variety of presentation spaces, as well as provide a reliable “transparent“ link between the camera and head end.